Born in Tarzana, CA, Megan Aveni spent a majority of her childhood in the various suburbs of Los Angeles. For a few years, she lived in Maryland, but really missed the warm weather and blue skies of California, so she was thankful to move back. A (quirky) intellectual who loves to challenge her brain, Megan is considering going back to school for a Ph.D in Political Theory and hopes for a future filled with travel and dance. Megan began dancing at the age of 20 at her best friend’s college swing club. She has been dancing for 6 years now, and teaching dance sporadically for about 3 years. While Megan doesn’t have a favorite dancer specifically, she does find herself drawn to dancers who seem to really enjoy themselves. The joy on their faces inspires her. This inspiration and passion for dance is what ultimately lead Megan to work at ATOMIC. 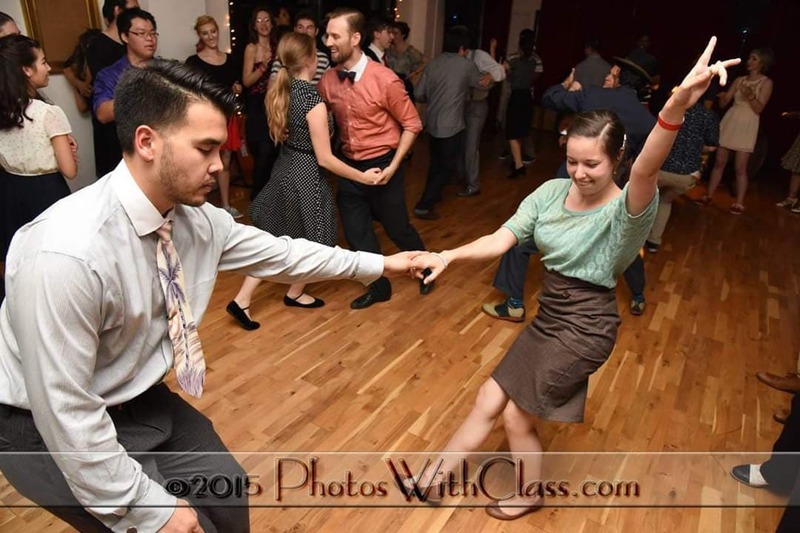 She started dancing at Atomic 5 years ago, carpooling with a group of friends from her local swing dance club. They enjoyed the warm atmosphere (along with regular cake) on every visit so much that she had a realization that the only thing better than attending ATOMIC for social dancing would be to work at ATOMIC and spend even more time on the premises. She wasn’t very happy with her job at the time, (which was) working at an after school program with kids. So resolved that it couldn’t get any better than to work at a place where she could dance the moment her shift was over, all while getting watching the love of dance blossom in others. Megan recalls being asked to work an ATOMIC event for Dapper Day at Disneyland, and how there was no turning back after that. She recalls those special first moments working at ATOMIC, along with her boyfriend also getting a job at the ballroom as being one of the most special and happier moments of her life. Megan went on to gush about her love of (working amongst) the family atmosphere at ATOMIC and how she feels such support from coworkers, bosses and patrons that allow her to always be herself. Megan says that she’s not sure what she would have done if she hadn’t starting working at ATOMIC. With it becoming such a huge part of her life and bringing her such joy and feeling of fulfillment, she and other staff members are excited to share their elation with veteran and new perspective patrons. With the new year now upon us and New Year’s Resolutions at the top of many lists, there’s no better time than the present to give dance a try at the friendliest ballroom in town, and experience just how much it can add to one’s life, just as it has for Megan and countless others! Megan was homeschooled all the way up through middle school. Megan loves to sleep. She’s taken entire weekends just to sleep and do nothing else. And though she’s generally not a cranky person, you will never see her more grumpy than when her sleep is interrupted.What are your other hobbies/interests?